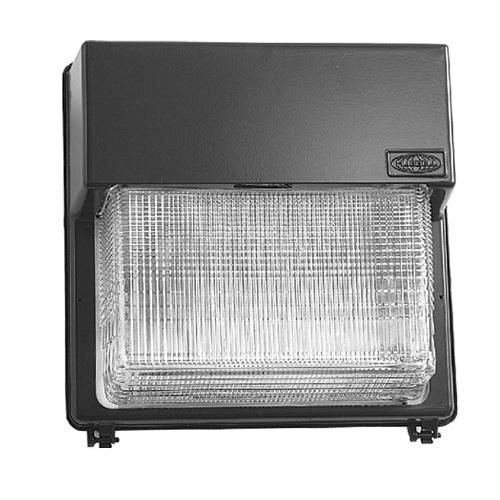 Hubbell Lighting Perimaliter® Collection Wallpack has voltage rating of 120 - 277-Volts. Specular aluminum reflector ensures to deliver enhanced light illumination. It has 150-Watt metal halide lamp. It features cast aluminum housing for firm mounting and heat dissipation. This wallpack comes with motion sensor, photocell and wireless control options for energy savings. Wallpack supports recessed mounting and offers wide lateral coverage with non-cut-off distribution. Porcelain Mogul base socket comes with spring-loaded center contact. It has two 1/2-Inch conduit hubs for feed-thru wiring. Battery backup feature provides an extra operating. It measures 14-7/8-Inch x 8-Inch x 15-Inch. Explicitly it is suitable for wall mount perimeter safety, security and identity applications. Wallpack is CSA certified and meets DLC requirements.